Two Catholic schools have been in the news for excluding the children of lesbian parents. In Massachusetts, the situation was defused when the Church made clear that exclusion was not diocesan policy, and promised to accommodate the child in another Catholic school. In Boulder, there was no satisfactory resolution, and there remain a great many disgruntled parents. Sr Jeannine Grammick one of the co-founders of New Ways Ministry, has been to Boulder, speaking at an event organised by Boulder Pride and PFLAG, about the importance of conscience, and her continued work of ministry in defiance f the Vatican. 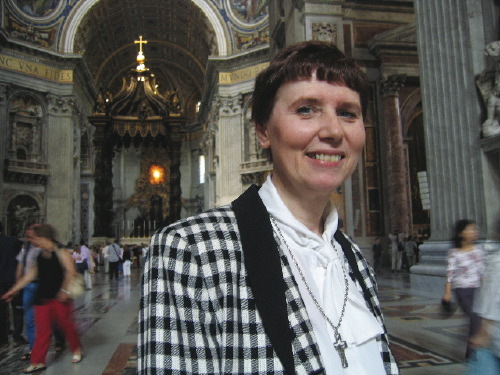 Sister Jeannine Gramick was ordered by the Vatican to stop ministering to gay and lesbian Catholics, but the outspoken nun didn’t listen. And you: what are you doing, for our gay brothers and sisters in church, and for New Ways Ministry ? Show your support. Join the Face book group, visit the News Ways Website and show support there. Write your bishops. New Ways Ministry is a gay-positive ministry of advocacy and justice for lesbian and gay Catholics and reconciliation within the larger Christian and civil communities. Through research, publication and education about homosexuality, New Ways Ministry fosters dialogue among groups and individuals, identify and combat personal and structural homophobia, work for changes in attitudes and promote the acceptance of gay and lesbian people as full and equal members of church and society. New Ways Ministry is at a critical point in its 33-year history. As you may have heard, Cardinal Francis George, president of the U.S. Conference of Catholic Bishops, issued a statement on February 5, 2010, saying that New Ways Ministry does not provide “an authentic interpretation of Catholic teaching.” Naturally, we disagree. Read our response to the right of this column. We are undaunted by this charge, and we plan to continue our ministry as we have been doing—as long as we have your continued support!